BRIAN Worldstar, how can I direct your call? 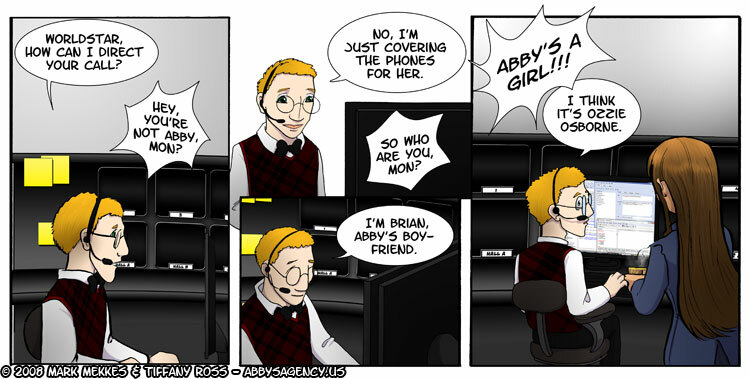 J Hey, you’re not Abby, mon? BRIAN No, I’m just covering the phones for her. J So who are you, mon? BRIAN I’m Brian, Abby’s boyfriend. BRIAN (to Abby as she returns to her desk) I think its Ozzie Osborne. Oh come on, nobody is that dense! Right? They’re always high. ^^ but that’s alright, they’re amusing! Don’t dense objects usually sink, so they’re low? Are we talking about Station J, or Brian? And here I was thinking it was just heir personality. Wait, didn’t one of them fantasise about her as a mermaid earlier? How can they think she’s a guy? No, I think they hallucinated that she was a mermaid. And a rainbow butterfly. And a strawberry with wings. It makes sense considering that the first Station J joke was a “stoner with the munchies” joke.